Middle school students are gaining a deeper sense of themselves as members of communities – both human communities and natural communities. They are becoming aware of how people’s actions impact others, and friends and relationships consume a lot of their thought and energy. • What social, economic and environmental benefits do forests provide? • How do human activities affect forests? • What can we do to protect Oregon’s forests? Forests can become a meaningful context for middle schoolers to design and conduct investigations, use evidence to analyze results, and examine issues from various perspectives. Activities such as these will help students gain a deeper appreciation of the interconnected relationships between people and the environment. Oregon is a great place to grow trees. One out of 20 Oregon jobs has to do with the forest sector. If you would like to introduce your students to some new career ideas, OFRI can help. 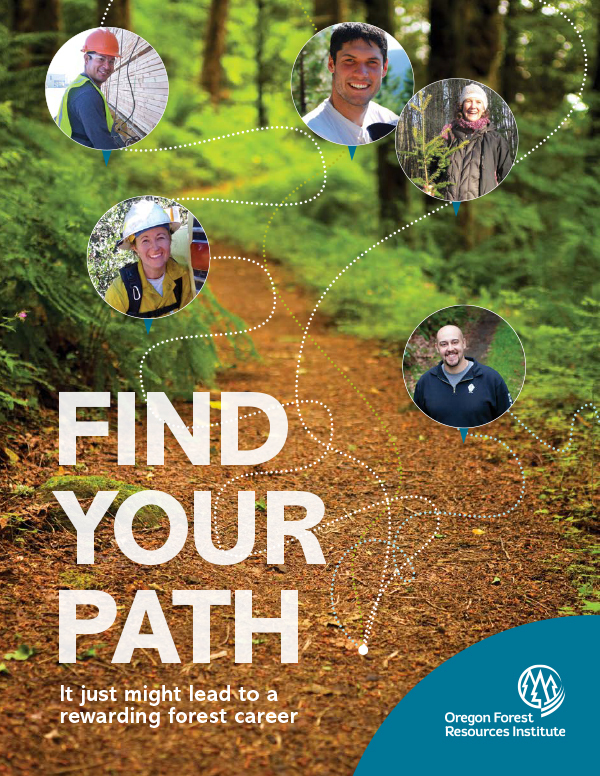 OFRI’s Find your Path publication and collection of online videos profile more than 20 people who work in forest-related jobs in Oregon, from a firefighter in Merlin to a forest economist in Portland. The booklet and videos show what these workers do, how they got where they are and what skills they needed.